The Roxar FSM Log 48 - with 48 referring to the number of pins in the sensing pin matrix - is a large-area, real-time solution capable of distinguishing between localised and generalised corrosion, a feature that helps reduce the need for pigging and other costlier inspection methods. It has a total cost of ownership of just one typical smart pig run of up to 10 kilometres (although this can vary according to the pig technology). The Roxar FSM Log 48 continuously monitors corrosion in remote areas using WLAN and cellular data transfer protocols and built-in solar power options that reduce maintenance and personnel requirements. Armed with comprehensive, real-time pipeline health information, operators can make better decisions about when and where to conduct pig runs, integrity digs and hydrostatic pressure tests, which helps to increase pipeline availability and transportation capacity. 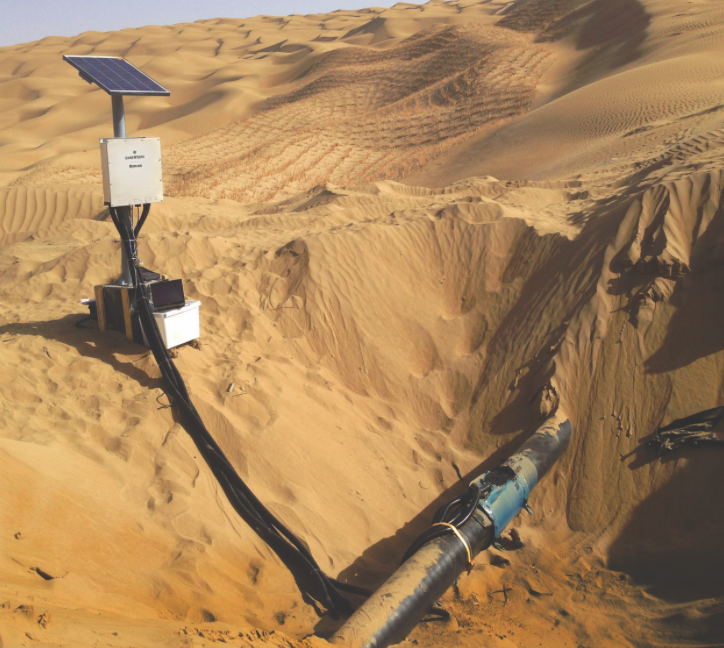 The system is specifically designed to work for both uncovered and buried pipelines and is installed on bottom pipe sections where water collection is most likely. It can be retrofitted to existing uncovered or buried pipelines and several units can be located over a pipeline, minimising the need for pigging to assess pipeline integrity and increasing transportation capacity. The Roxar FSM Log 48 uses the non-intrusive field signature method, in which an electric current is fed through the monitored length of pipeline to generate an electric field. The initial measurement sequence measures the voltage drop between pairs of sensing pins installed on the external pipe wall. Later measurements are compared to the field signature, where a uniform increase in voltage drops between all pin pairs indicates generalised corrosion, and a local increase in the values indicates localised corrosion. Typical detection sensitivity for generalised corrosion is 0.1% of wall thickness for outer pipeline diameters between six and 48 inches.